Owls in the Family by Farley Mowat. This site was created by your teachers, Ms. Nash and Mrs. Coiro. From this site, you will be able to access all of the Internet resources you'll need to complete some of the tasks assigned to you as part of this learning unit. With your permission, we'll be sharing some of your work at a conference for teachers in November! If you have time, there are some extra cool resources to check out at the end of this page. Be sure to write down the web site address for this page and you can access these links at home to share what you're learning about in school with your parents! After participating in the large group demonstration of using Inspiration, use the software tool to create a visual diagram that illustrates the similarities and differences between Weeps and Wol, the two main characters in the story. Click on the Inspiration logo to view some examples of how to use this software to create story maps and compare characters. Farley Mowat, the author of Owls in the Family, has been invited to your school for The Annual Author Visit and you are responsible for introducing him to your peers and the rest of the audience. Use the following resources to write a short introductory speech, no longer than two minutes. When all groups are finished composing their speech, each group will designate a speaker to share your speech with the rest of the class. 1. Bring along your note pad and be prepared for a virtual exploration of the Strange Case of Mystery Rock. 2. Try your hand at drawing owls using samples of owl artwork or printing out this Great Horned Owl coloring activity. 3. Design an activity (word find, matching quiz, multiple choice, crossword puzzle, concentration game) using Quia using information from Owls in the Family. Post it online for your classmates to complete. 4. 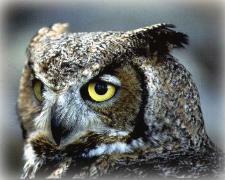 Read an amusing Interview with a Great Horned Owl from Rebop, the yellow corn snake. 5. Learn more about many different types of owls in Alberta, Canada. 6. Can you tell what this owl ate from the owl pellet? See students in action as they take apart an owl pellet. 7. Learn just about anything else you could imagine about any type of owl with a few visits to The Owl Pages. Take a look around the photo gallery, locate owls of the world, and find out more about the special features of an owl. 8. Find out what other students your age learned in a project like yours on the award winning fourth/fifth grade web site created about Birds of Prey. Their project was named as the West region winner in the 2000 IRA Presidential Award for Reading and Technology contest.